This is a free tip for how to cast your own voodoo protection spell. All you need for the spell is a voodoo doll, a necklace or bracelet charm, and an essential oil of your choosing. This do it yourself protection spell is going to work to keep you safe like a force field. The goal is to stop bad luck, curses and hexes so that they can not get to you. It can also help to prevent bad luck such as falls or random accidents. A voodoo protection spell can also help to stop negativity from blighting your life. The goal is to have the good things in life flow your way. So why cast a voodoo spell? It is likely that if you are interested in doing so, there is some evil around you and you instinctively feel the influence of it. By casting a spell you can acknowledge and take a stand agaist these evil roots to stop them from growing. You want to go about your everyday life without feeling like you’re doomed or a victim. The spell helps to defend your being and works to bounce evil right back off of you. Your voodoo doll and charm must be new so as to not have any past negative energy. You can make a new doll from craft materials, or purchase one online or at an occult or gift store. The charm can be a small charm you buy, which can be a heart, clover, symbol, or some other charm form that you cherish. You are going to do a small ceremony to gently clean off dirt or dust from the doll as well as wash the charm in gentle soapy water. You are then going to dry the charm and anoint it with a few drops of your favorite essential oil. It can be a fragrance of your choosing, just one that makes you feel serene and happy when you smell it. It should be a beloved fragrance. 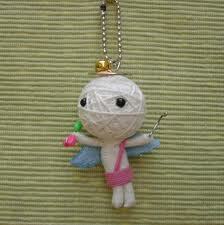 Next go to a quiet place where you feel relaxed and put the annointed charm on the voodoo doll using a string or chain. As you annoint the charm with your favorite essential oil, and place the charm onto the doll using a string or necklace chain, you are going to focus your mental energy on the evil you wish to banish from your life. Now you have an evil protection voodoo doll with charm that has been annointed with oil. Carry the doll with you for personal protection, or if you are trying to protect your home then hang the charm near the yard entrace, front or back door to your home where you want evil protection. If you are trying to protect your family then keep the charm near an area with family photos inside your house. You should feel safer which will give you a serenity and peace of mind. If there are people in your inner circle that you fear will hurt you (or that have threatened you or hurt you before) then take appropriate legal measures as necessary so that they cannot come near you and your loved ones. Be sure to tell someone you trust that you fear for your safety and why. It can also help to tell a trusted person how you feel. Having peace of mind is key. Good luck! Posted on March 28, 2013 by admin. This entry was posted in Voodoo. Bookmark the permalink.